Brilliant Birthdays Bespoke Balloon Sculptures add a wow factor to Product Launches, Family Events and Shopping Centre Activities. 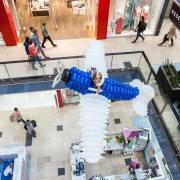 Our Expert Balloonologist will create a Bespoke Unique Display especially for your event. There are no limits to what can be achieved contact us today for a no obligation quote on your event or Party.